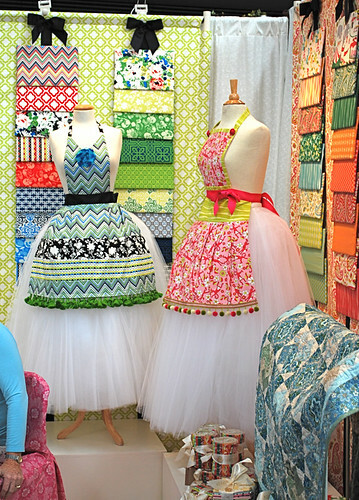 Quilt Market Grande Finale Friday - Stop staring and start sewing! One thing I really liked about this Quilt Market was the way the guys were representing. 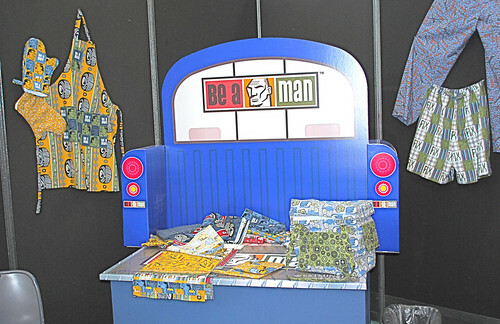 Here is the Be a Man display (a tailgate!) in the Free Spirit row. I can't wait to get my hands on this fabric! 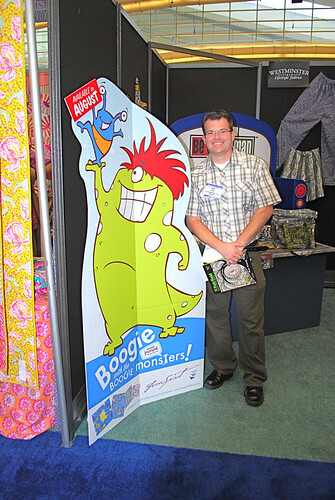 And here is Scott Jarrard, one of Free Spirit's new designers, standing next to his Boogie Monster creation. Nice guy, great designs! 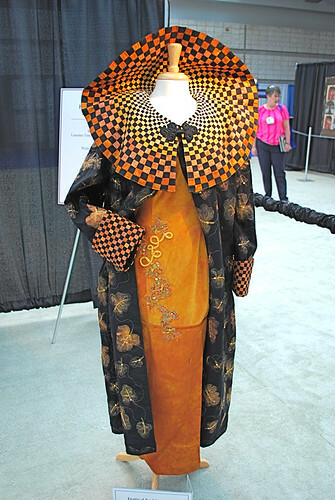 Check out his site (with fabric peeks)! 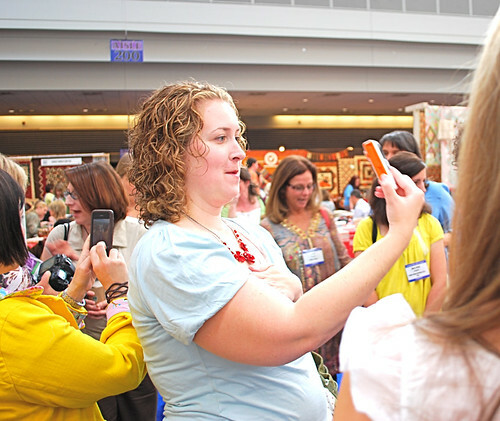 Okay, so here's Joey chatting with a gal at the Colonial Needle Company booth. One thing Joey was pleased to discover at market is that women really like a man who knits. He was flashing his socks to anyone who would look (you know the socks I wanted for myself? yes, those). Here is Anna Griffin's fresh and frothy booth. Seriously dreamy! 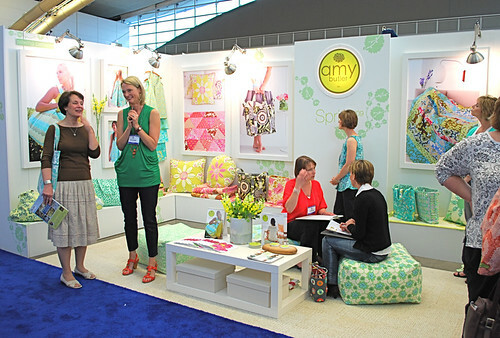 Here is the ever gracious and uber creative Amy Butler in her booth (quite the popular place). Here is Sandi with her little video recorder. I had no idea she was video blogging the whole time (I mean I saw the camera but didn't quite catch onto the fact that she intended to put this stuff on her blog). So tune in over there because I understand there are a few folks concerned about being seen with no make-up (could get interesting). Oh, and if you look over Sandi's shoulder in the above picture (on the right side) you'll see April Cornell (yes! April Cornell!) with the long hair. 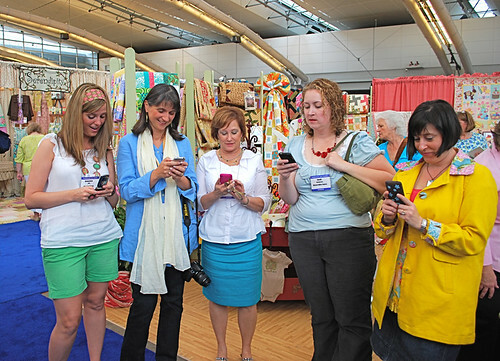 April organized a "Twitter meet up" so we all gathered at the Moda booth at 10:00 on Saturday. It's kind of like a flash mob but more genteel. Here you can see Jennifer Paganelli gathered with us. Jennifer drove down from Connecticut and apparently it was a longer drive than expected so we didn't get to see her until Saturday morning. And here are Designing Women who Tweet. Genevieve Gail, Joanna Figueroa (finally got to meet her and she's sooo nice! 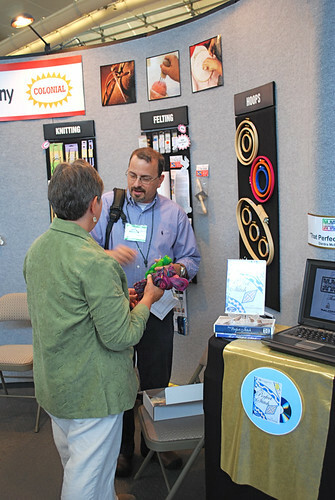 ), Paula Prass, Sandi Henderson, and Bari J Ackerman. Now one of these ladies has no idea how to tweet from her phone so she's faking it, but I'm not telling which one it is! Okay, what's the worst thing that can happen at a fashion event???? Someone else showing up in the same fabric!! Ack! 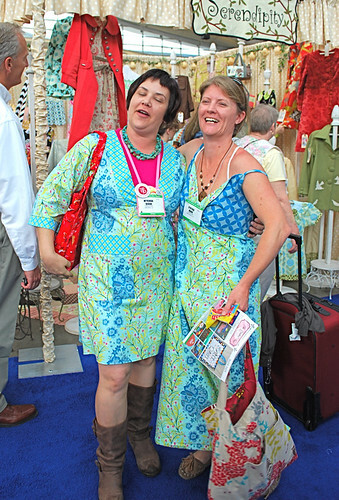 Here are Myrinda from Fabric Hound and Cynthia Mann from Fabric Worm who ran into each other and became instant best friends. Too much fun! Another amazing quilt. 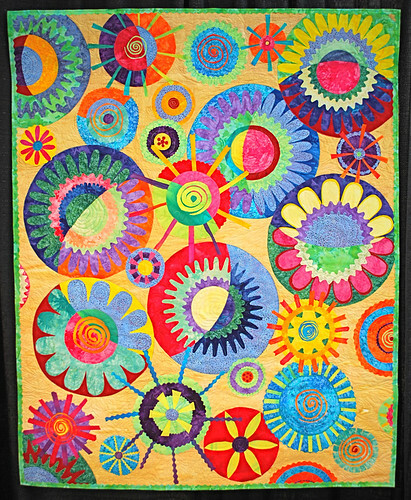 This is Cinda's Circles by Karen Pharr. Wow! And double wow! A Walk in the Autumn Garden by Kathy Howard. This is one of the Moda fabrics I ordered for the store. It's called au.then.tic by Sweetwater and it gorgeous. Vibrant and soothing at the same time. Closer look at some of the prints. And I couldn't stop myself from ordering a whole bunch of Rouenneries by French General. It includes linens, linen blends and some "silkies". Oh, and amazing ticking stripes. Okay, so here's what's coming! From Free Spirit...Vicki Payne's For your Home (shipping to me now! ), David Walker's Oh Boy, Douglas Day's Be a Man, Dena's Christmas Snow (and I'm hoping to squeeze in Jenean Morrison's Picnic Parade). From Michael Miller....Paula Prass's Summer Soiree, Patty Young's Mezzanine, Pillow and Maxfield's Whimsy, and Laura Gunn's Lantern Bloom. From Moda...French General's Rouenneries, Sweetwater's au.then.tic. Whew! Oh and a bunch of patterns from Pink Fig and Boutique Chic!! As for me, I have 8 patterns (yes 8!) on my drawing board that we intend to have available in time for the Fall Quilt Market (which is only 5 months away!). So you can stop nagging me because I'm seriously working on it (like right now!). Or maybe you should keep nagging me so I don't get lazy here?! Anyway, I appreciate any encouragement! Alrighty then!! The winner of yesterday's Learn to Sew Lace up Cards (which are now for sale here in my store!) give-away is Pam (as in Pam Kitty Morning, one of my favorite quilty bloggy type friends ever!!)! Be happy for Pam (you still have one more chance!) 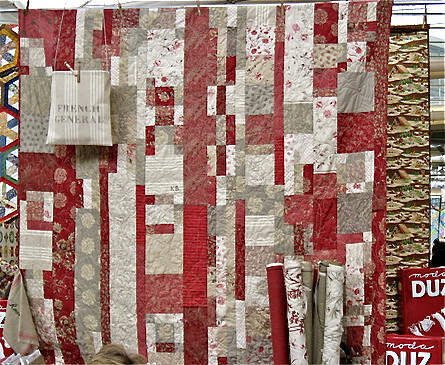 and run over to her blog because she has some great Quilt Market posts from the perspective of a quilter (imagine that)! And the final give-away for the week is a real humdinger! 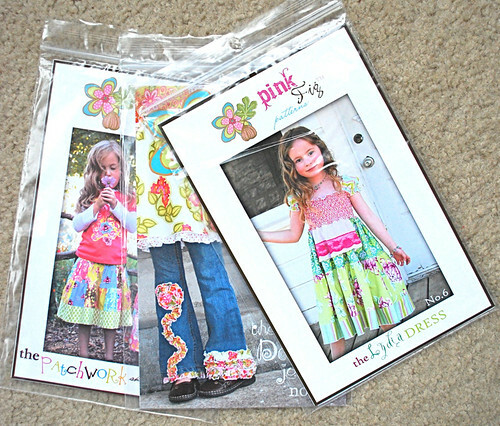 3 patterns from Pink Fig (a 30.00 value!). I know a lot of you sew for your daughters and granddaughters so I'm sure these will find a very happy home. Just leave a comment (like I need to tell you!). Whew! I hope everybody liked my re-cap this week. It was lots of fun bringing it to you! 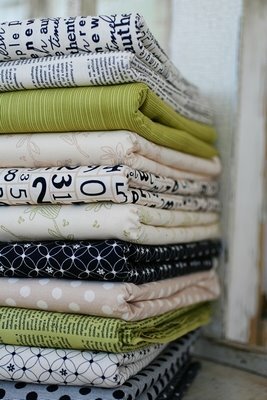 Please follow the links to some of the new folks popping up in the fabric world and give them lots of encouragement (and the "old folks" too!). I can't express how much I love being a part of this incredible industry. It is filled with people who are not just talented but incredibly kind (I haven't met one mean person yet!). I've been blessed with wonderful friendships that make it hard to leave Quilt Market without crying. 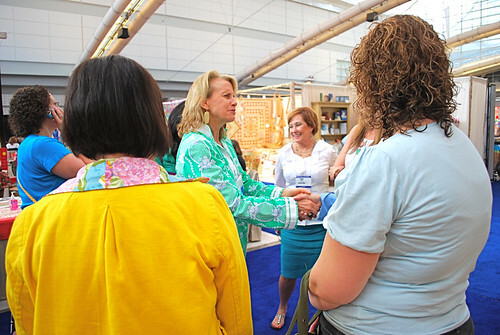 There's nothing quite like being able to spend time with people who totally understand each other's fabric obsessions! October can't get here soon enough!